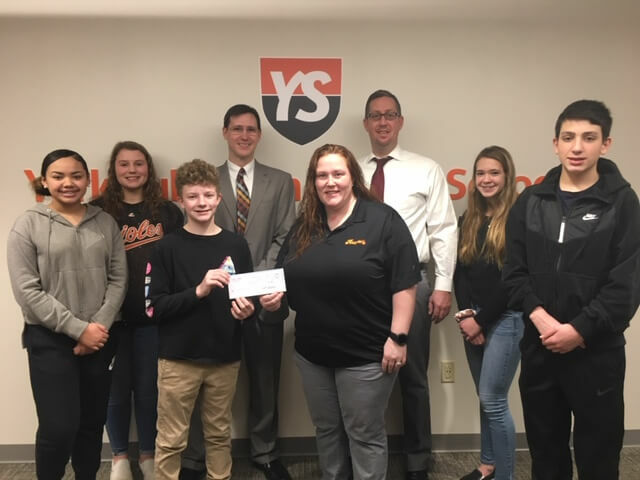 Attorney Mac Brillhart, President of York Suburban Education Foundation, poses with York Suburban School District middle school Principal Scott Shirey and students in graciously accepting Rutter’s EITC donation to the York Suburban Education Foundation. The Educational Improvement Tax Credit (EITC) program, administered through the Department of Community and Economic Development (DCED), awards eligible businesses tax credits for providing contributions to scholarship organizations, and/or educational improvement organizations and/or pre-kindergarten scholarship organizations. DCED maintains a list of approved organizations. Brillhart, a graduate of York Suburban School District, was appointed to serve as President to the York Suburban Education Foundation on January 1, 2019.